Blu-ray™, DVD and digital December 20 from Well Go USA Entertainment. Told he wasn’t good enough to play Division I football, Burlsworth (played by Chris Severio) took a risk and walked on in 1994, becoming the most respected player in the history of the program. GREATER also stars Neal McDonough (“Arrow”), Leslie Easterbrook (Police Academy franchise), Michael Parks (Kill Bill, Django Unchained) and Nick Searcy (“Justified”). Bonus materials include bloopers, deleted scenes and writer & director commentary. The unlikely career of Brandon Burlsworth is the greatest walk-on story in the history of college football. Known for his distinctive black horn-rimmed glasses and resemblance to Superman’s alter ego, Clark Kent, the small-town Burlsworth had always dreamed of playing for the Arkansas Razorbacks, but was considered too short and too fat to play Division I football. Undeterred, Brandon, with the help of his struggling mother, took a financial and emotional risk by walking on to the team in 1994. Despite criticism from teammates and coaches alike, Brandon succeeded in the face of staggering odds. His faith and unstoppable determination helped him rise to the forefront of the team; and by the end of his college career in 1999, Burlsworth was not only a star player in the toughest conference (The SEC), but he was also a 1st Team All-American. 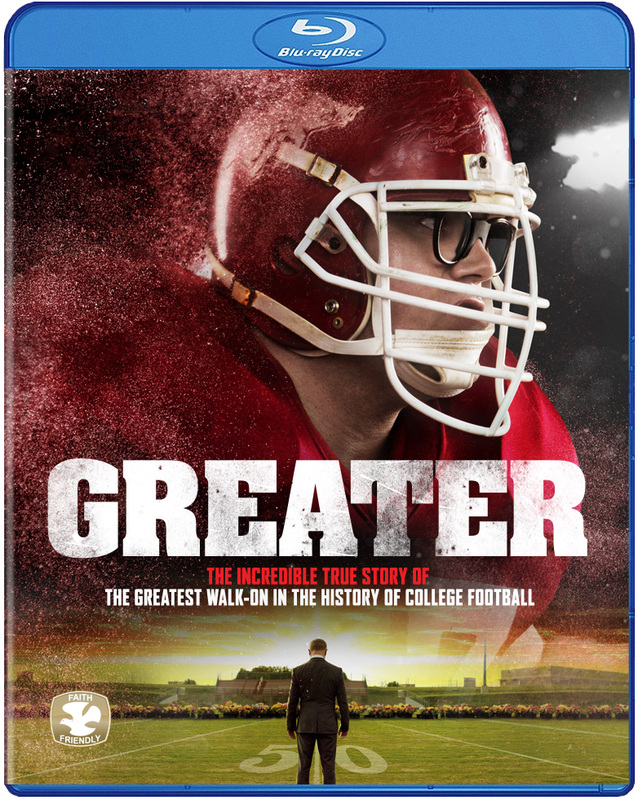 GREATER has a runtime of approximately 130 minutes and is rated PG for thematic elements, some language and smoking. Follow @WellGoUSA on Facebook and Twitter and be sure to use #GreaterMovie when socializing your coverage. For more information, please visit www.wellgousa.com.